Soccer is the world’s most popular sport, and the Brazilian national team is beloved around the planet for its beautiful playing style, the jogo bonito. With the most successful national soccer team in the history of the World Cup, Brazil is the only country to have played in every competition and the winner of more championships than any other nation. Soccer is perceived, like carnival and samba, to be quintessentially Brazilian and Afro-Brazilian. Yet the practice and history of soccer are also synonymous with conflict and contradiction as Brazil continues its trajectory toward modernity and economic power. The ongoing debate over how Team Brazil should play and positively represent a nation of demanding supporters bears on many crucial facets of a country riven by racial and class tensions. The Country of Football is filled with engaging stories of star players and other key figures, as well as extraordinary research on local, national, and international soccer communities. 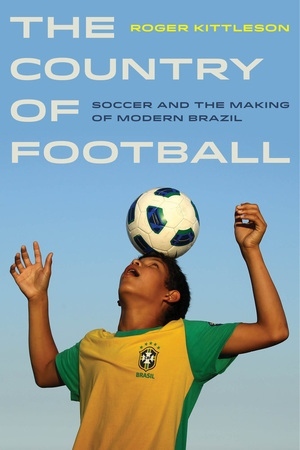 Soccer fans, scholars, and readers who are interested in the history of sport will emerge with a greater understanding of the complex relationship between Brazilian soccer and the nation’s history. Roger Kittleson is Professor of History at Williams College and the author of The Practice of Politics in Postcolonial Brazil: Porto Alegre, 1845–1895.